The meeting of 18 oil-exporting countries, which took place April 17 in Doha (Qatar), finished ... nothing. Contrary to the allegations of "grave concern" about the fall in world prices of official representatives of the member countries of OPEC, none of them was not ready to take the plunge - cut production and donate a part of its share of the world market for the illusive prospects of returning the main source of foreign exchange earnings to the value of at least up to $ 50 per barrel. Actually, that will not be able to agree, it was clear from the beginning of the meeting. Representatives of Riyadh - contrary to earlier agreements, despite the fact that Iran has announced its position even a day before the meeting, the participants arrived in Doha - immediately said that as at the negotiating table is not Iran, and to talk about . 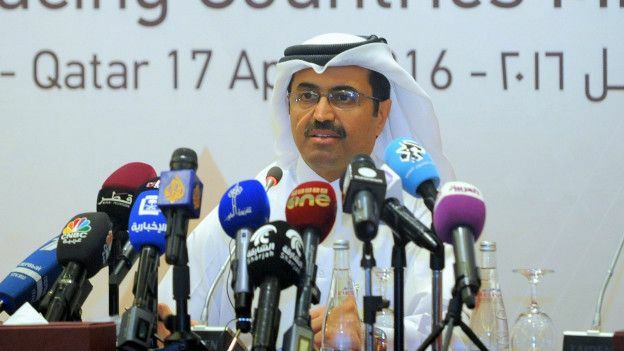 After which lasted nearly two hours of unsuccessful attempts to persuade the Saudi delegation to soften its position, the participants took a break and went to a meeting with the Emir of Qatar.Local oil minister, Mohammed bin Saleh al-Sada has tried to assure journalists that "everything is going according to plan", but quickly gathered optimism ebbed. To finally disappear after six hours of talks. The main reason for the fact that the meeting in Qatar - OPEC countries plus Russia - could not agree on a number of observers were quick to call Tehran's refusal to not participate in the freezing volume of oil production, nor even in the negotiations on this subject. With that truth in this statement is, despite the fact that the lack of Iranian officials initially made the achievement of any agreement to be problematic, yet it would be necessary to note that just as difficult to reach agreements made non-participation in the meeting of the representatives of the United States and Libya. But the main causes of failure of the Qatari meeting were of course no question turnout of certain oil producers, and, firstly, Riyadh's position and, secondly, the conditions of the proposed "freeze." "In 2014, OPEC members revenues amounted to about one trillion dollars. In the past year they have decreased by about fifty percent. And three months of 2016 fell by 20%, "- says the current situation, Daniel Yergin, one of the most competent experts in everything that is connected with the world oil market.- "This creates enormous difficulties for the governments of these countries. Budgets require sequestration, credit ratings are falling, increasing the risk of social unrest. " But, he notes the degree of severity of the problems associated with the fall of prices for each different state-oil producer. If Angola has appealed for help to the International Monetary Fund (IMF), then the same Riyadh margin where as above, which is actively used by the current leadership of the Kingdom.Including - and in foreign policy. Back in 2015, when prices went down rapidly, the management of Saudi Arabia, weighing all the "pros" and "cons", formulated the basic principles of conduct in the period to reduce the cost of their main resource, oil - "the preservation of the world market share is more important than price." That is, the price may fall, but exports in the first place - for large customers, must be preserved. Given the low cost of production and the volume of foreign exchange reserves, which were accumulated in Riyadh "fat years", the decision is more than reasonable and more importantly, it is feasible. Even at a price of $ 20-25 per barrel ruling dynasty has the ability not only to maintain "social package" for its own citizens (migrant workers as everyone knows, this number is not included), and run the program to modernize the country, the official presentation which will take place on 25 th of april this year. A foreign policy of Saudi finance stability allows them to actively intriguing solving, with the support of the US and Israeli ruling circles, the main task - to deter Iran, opposition spread its influence in the region, from Sana'a to Damascus and beyond - everywhere. What, in fact, been more clearly demonstrated than in February and March this year, when unsubstantiated promises Riyadh reduce the volume of production and thus stop the fall in prices were widely used in the negotiations with Moscow and Washington on a truce in the Syrian conflict. How sincere were the Saudis, supporting two months ago, a proposal to "freeze" of oil production at the level of January 2016, the year? It appears that in any way. The main factor for them was not even the price, and the position on the issue of Tehran. Since taking over unilaterally any restrictions that can give a competitive advantage to Iran, the Saudis will not accept under any circumstances. And the fact that Tehran is playing on the "frozen" will not play - it was clear from the outset. Why do not the Iranians have arrived in Doha? "We came to the conclusion that Doha will meet those who are seriously prepared to discuss plans for the freezing of oil production and sign an agreement", - he said in an interview with Iranian media Oil Minister Bijan Zanganeh country. - "But because Iran has no intention of signing on this issue, there is no need for the presence of our representatives at this meeting." It should be noted Tehran's consistency in this situation. The fact that the agreement on the freezing of the volume in any way do not meet the interests of the country, officials of the Islamic Republic openly and unambiguously declared in February and in March. As for any unbiased observer it is obvious that formulated the already mentioned Zanganeh: "If Iran freeze oil production ... it will not be able to benefit from the lifting of sanctions." And what if there were years of difficult negotiations, maneuvers and compromises on the nuclear program? What was a great effort, if as a result of any state budget or the economy does not get much-needed funds to overcome the "crippling" sanctions the consequences? Iran's position has caused irritation in a number of Russian commentators - some of which even started talking about the "knife in the back of Russia" - and some schadenfreude in Western commentators - that is, they say, what about the "strategic partnership" Tehran and Moscow. But if you look at the situation without prejudice, the picture starts to look quite differently. OPEC daily issue on the market 32.3 million barrels (as of March of this year). Moreover, last year the figure was 31.9 million barrels. One third of that amount accounted for Saudi Arabia. That is, the principle of "preservation of global market share is more important than price" is being implemented in full. In second place for the extraction - Russia. In March of this year, oil production in the country increased by almost 1 million tonnes compared with the figures for the previous year - 10.885 million barrels, an increase of 2%. Moreover, exports of "black gold" from Russia rose in March by 3.9%. Against this backdrop, Iran's production figures - 3.5 million barrels, of which exports are about 1.8 million - look much more modest, and even their increase is not capable of a serious impact on world prices, which, incidentally, most experts converge unanimously. And what's the interest in Tehran to join the "freezing"? Unsubscribe from additional revenues in a difficult economic situation? Bring national interests on the altar of some abstract "solidarity oil producers", which is not in sight? Recognize that traditional Iranian oil markets of India, China, South Korea and other countries, "pressed" him during the Saudis supported the same Moscow sanctions now forever closed to him? There is another aspect of the agreement that was made to the countries participating in the meeting in Doha. It is, as aptly noted by the magazine The Economist, is purely "gentleman's" character. That is to say, restrictions which take the signatories of this document states, is completely non-binding and does not provide any mechanisms for monitoring its implementation. Each signatory here - the owner of his word - as it is made and, if necessary, to take back. Does it make sense not only to sign this kind of texts, but also participate in a serious discussion? It seems that no. What, in fact, did Iran. In an effort to sweeten the bitterness of failure Qatari Oil Minister Mohammed bin Saleh Al-Sada, summing up the meeting in Doha, he said the oil-exporting countries needed more time to consider the proposed agreement. And the conversation on this subject they will be back in June of this year, at the next OPEC meeting. And then - come back once more, at a conference in Moscow, scheduled, according to the Russian side, in October. It appears that these meetings will give the same result as the past April 17 meeting in Doha. Too different interests among the states taking part in these conversations about the "freezing."